The pure material is colorless, however pieces of technical-grade calcium carbide are grey or brown and consist of about 80–85% of CaC2 (the rest is CaO (calcium oxide), Ca3P2 (calcium phosphide), CaS (calcium sulfide), Ca3N2 (calcium nitride), SiC (silicon carbide), etc.). In the presence of trace moisture, technical-grade calcium carbide emits an unpleasant odor reminiscent of garlic. The high temperature required for this reaction is not practically achievable by traditional combustion, so the reaction is performed in an electric arc furnace with graphite electrodes. The carbide product produced generally contains around 80% calcium carbide by weight. The carbide is crushed to produce small lumps that can range from a few mm up to 50 mm. The impurities are concentrated in the finer fractions. The CaC2 content of the product is assayed by measuring the amount of acetylene produced on hydrolysis. As an example, the British and German standards for the content of the coarser fractions are 295 L/kg and 300 L/kg respectively (at 101 kPa pressure and 20 °C temperature). Impurities present in the carbide include phosphide, which produces phosphine when hydrolysed. This reaction was an important part of the industrial revolution in chemistry, and was made possible in the USA as a result of massive amounts of inexpensive hydroelectric power produced at Niagara Falls before the turn of the 20th century. The method for the production in an electric arc furnace was discovered in 1892 by T. L Willson and independently by H. Moissan in the same year. Pure calcium carbide is a colourless solid. The common crystalline form at room temperature is a distorted rock-salt structure with the C22− units lying parallel. The reaction of calcium carbide with water, producing acetylene and calcium hydroxide, was discovered by Friedrich Wöhler in 1862. 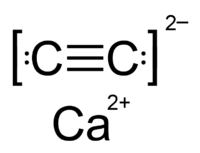 This reaction was the basis of the industrial manufacture of acetylene, and is the major industrial use of calcium carbide. At high temperatures, CaC2 reacts with water vapor to give calcium carbonate, carbon dioxide and hydrogen. Today acetylene is mainly manufactured by the partial combustion of methane or appears as a side product in the ethylene stream from cracking of hydrocarbons. Approximately 400,000 tonnes are produced this way annually (see Acetylene Preparation). In China, acetylene derived from calcium carbide remains a raw material for the chemical industry, in particular for the production of polyvinyl chloride. Locally produced acetylene is more economical than using imported oil. Production of calcium carbide in China has been increasing. In 2005 output was 8.94 million tons, with the capacity to produce 17 million tons. In the USA, Europe, and Japan, consumption of calcium carbide is generally declining. Production levels in the USA in 1990s were 236,000 tons per year. Commonly known as nitrolim, calcium cyanamide is used as fertilizer. It is hydrolysed to cyanamide, H2NCN. as a fuel in steelmaking to extend the scrap ratio to liquid iron, depending on economics. as a powerful deoxidizer at ladle treatment facilities. Calcium carbide is used in carbide lamps. Water dripping on carbide produces acetylene gas, which burns and produces light. While these lamps gave steadier and brighter light than candles, they were dangerous in coal mines, where flammable methane gas made them a serious hazard. The presence of flammable gases in coal mines led to miner safety lamps such as the Davy lamp, in which a wire gauze reduces the risk of methane ignition. Carbide lamps were still used extensively in slate, copper, and tin mines where methane is not a serious hazard. Most miner's lamps have now been replaced by electric lamps. Carbide lamps are still used for mining in some less wealthy countries, for example in the silver mines near Potosí, Bolivia. Carbide lamps are also still used by some cavers exploring caves and other underground areas, although they are increasingly being replaced in this use by LED lights. 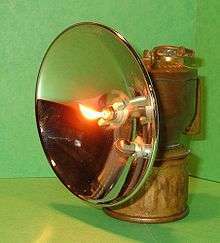 Carbide lamps were also used extensively as headlights in early automobiles, motorcycles and bicycles, but have been replaced entirely by electric lamps. In the artificial ripening of fruit, calcium carbide is sometimes used as source of acetylene gas, which is a ripening agent similar to ethylene. However, this is illegal in some countries because consumption of fruits artificially ripened using calcium carbide can cause serious health problems in those who eat them. Calcium carbide is used in toy cannons such as the Big-Bang Cannon, as well as in bamboo cannons. 1 2 3 4 Greenwood, Norman N.; Earnshaw, Alan (1997). Chemistry of the Elements (2nd ed.). Butterworth-Heinemann. p. 298. ISBN 0-08-037941-9. ↑ Freeman, Horace (1919). "Manufacture of Cyanamide". The Chemical News and the Journal of Physical Science. 117: 232. Retrieved 23 December 2013. ↑ F. B. Abeles and H. E. Gahagan, III (1968). "Abscission: The Role of Ethylene, Ethylene Analogues, Carbon Dioxide, and Oxygen". Plant Physiol. 43 (8): 1255–1258. doi:10.1104/pp.43.8.1255. PMC 1087003 . PMID 16656908. ↑ "Bet on it. Your mango is ripened using carbide". Daily News and Analysis. May 18, 2013. Retrieved 2013-05-19.